With each box packed with love by fellow Chronic Illness sufferers, you can count on each product being tailored just for you. Each individual product in ChronicAlly Box is your personal ally. Each product is your ally by making your health and beauty routine better and easier. The original Chronic Illness Girl's Health and Beauty subscription box, ChronicAlly Box, contains lavish and necessary products for the Chronic Illness Girl's life. Every month, you can expect a treasure box full of health and beauty products to make your beauty routine possible in a pinch, with little effort. Health products for your body and mind, giving you the ability to unwind. Imagine getting something else in the mail besides medical bills & lab results. With ChronicAlly Box, we do just that by delivering 100% guaranteed smiles with each shipment to your door. ChronicAlly Box serves as your ally by saving you a trip to the mall when you're just too sick, tired, or both. We donate a portion of all sales to chronic illness causes. 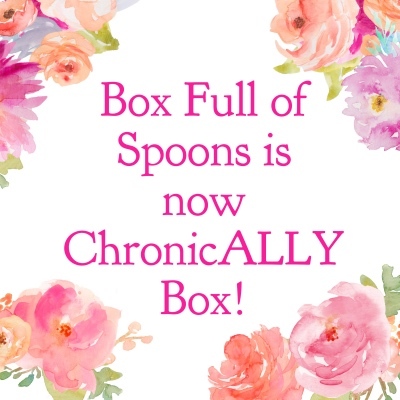 Join the ChronicAlly Box Tribe Today! Whether you're getting it or gifting it, join today to get 10% off for life.